One month ago, ask me what my biggest pain during a long run was. Not my shins, not my knees...it was the cords to my headphones. Although I ran with Bose headphones, I hate hate hate hate hate cords. NO matter what I do, they somehow are there. In the past year, I have learned how to deal with them. This was until I was introduced to Sony's W series. Bye bye Bose. Sony W means one word to me: Walkman. I remember asking Santa for my first Walkman in the early 90's (or late 80's? yeesh!) and here I am writing about a wireless Walkman MP3 player! The Sony W is a one piece and cordless MP3 player which stays out of your way whether you’re at the gym or on the trail. 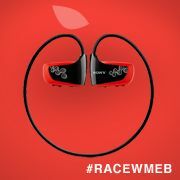 One happy note is that it is water resistant....I live in FL, I deal with the rain more often than not while training. Along with this, you will receive pre-loaded runners’ tips from nutrition to stretching along with a running booklet from one of my heroes, Olympian Meb Keflezighi. Back to the W - this piece offers drag & drop from iTunes!!!!! It has 2 GB internal memory and a quick 2 3-min charge. YES, a two minute charge! The W also has up to 60-min of battery life which is great for those training runs. I found the navigation of songs & folders to be very simple. It has amazing sound as well (coming from a Bose girl, this should mean a lot). We are not done here.Contest time! Do you want the chance to train with Meb? I sure as hell do. Do you want an opportunity to run the Rock n Roll Half Marathon in Las Vegas? You may have to fight me for that....or a trip to Austin Texas music festival? Then it is time to Rock with Meb! 1. 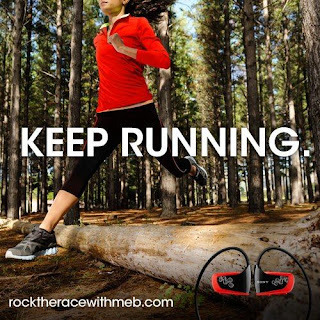 Visit rocktheracewithmeb.com and connect with your Facebook account. 2. Accept the Rock the Race with Meb application, and then you’re automatically entered to win one of the three grand prize packages. 4. Get 55 friends of friends to accept and pass the mic, and you’ll be cruising across the finish line! This is really easy....imagine all the Farmville and Poker invites you get on facebook. This one is actually making a difference.